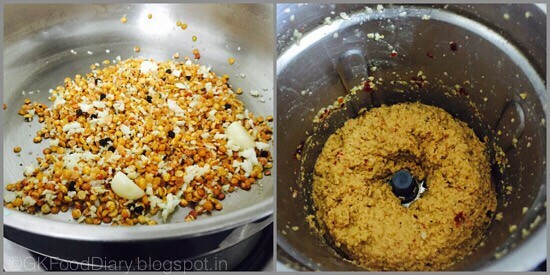 Thogayal/thuvaiyal recipes comes handy and comes to rescue during the rush. They are apt for travels too. 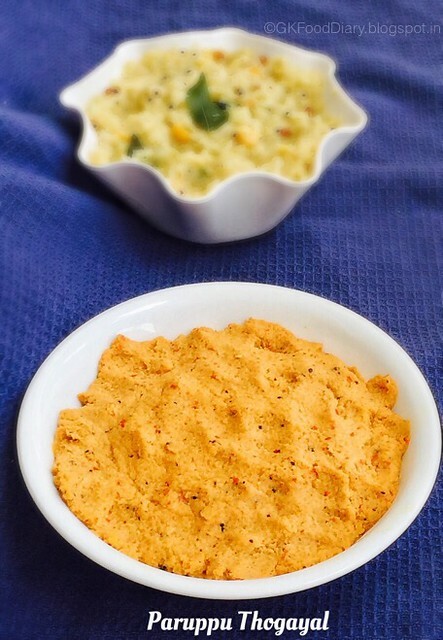 Paruppu thogayal is made with toor dal, spices and coconut. I make this paruppu thuvaiyal when I have no mood to cook. 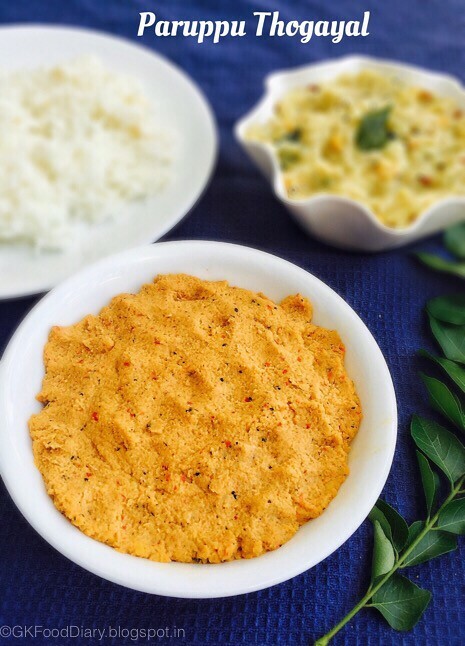 Though making this thogayal is quick and easy, but it’s tasty, flavorful and healthy as well. It goes well with steamed rice, rasam and kootu. Amma makes different types of thuvaiyal for lunch and I like all of them. 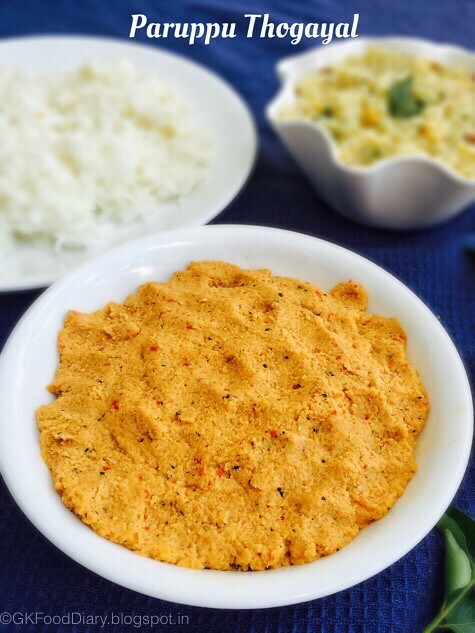 I will post all the varieties of thogayal recipes soon in this space. 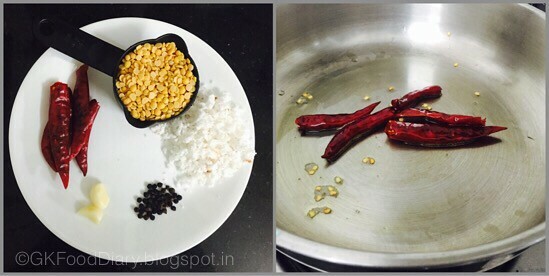 Let’s see how to make this simple paruppu thogayal recipe. 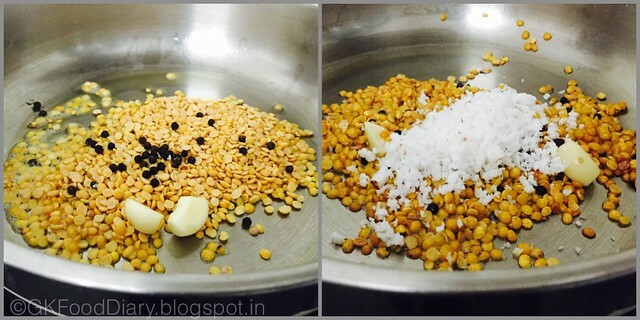 South Indian Tamilnadu style easy and flavorful thuvaiyal with lentils. Take all your ingredients and keep it ready. Heat a tsp of oil in a pan and add red chillies and fry it in medium flame for a minute. Remove from the pan and set aside. In the same pan, add toor dal, black pepper and garlic. Fry them in medium flame until toor dal gets golden brown. Don't burn the dal to turn black as it spoils the whole taste of the thuvaiyal. Once the toor dal turns golden brown, add grated coconut. 1. Take all your ingredients and keep it ready. Heat a tsp of oil in a pan and add red chillies and fry it in medium flame for a minute. Remove from the pan and set aside. 2. In the same pan, add toor dal, black pepper and garlic. Fry them in medium flame until toor dal gets golden brown. Don’t burn the dal to turn black as it spoils the whole taste of the thuvaiyal. Once the toor dal turns golden brown, add grated coconut. 3. Give a quick stir and switch off the flame. Transfer the roasted ingredients to a mixer along with salt and hing. Grind it to a coarse paste by adding little water. Thuvaiyal has to be thick so add water accordingly. 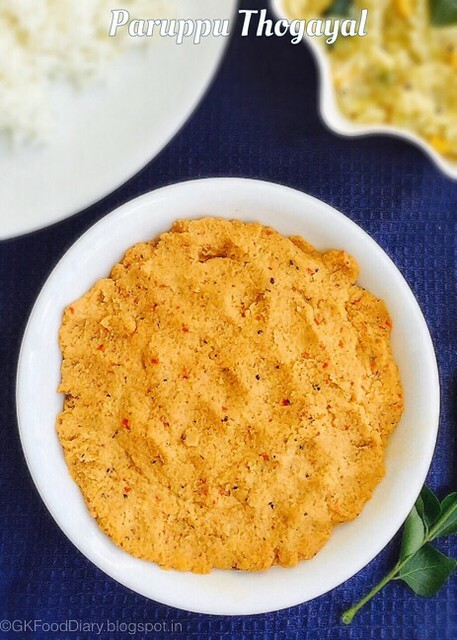 Serve the paruppu thogayal with hot steamed rice and generous amount of ghee or sesame oil. We had it with steamed rice and cabbage Kootu! Keep the flame in low to medium while frying the ingredients. Don’t burn the dal to turn black while frying as it spoils the whole taste of the thuvaiyal. You can skip coconut and make this thuvaiyal, but I recommend to add coconut as it enhances the taste.